Although I have a part time job as a nanny, I consider mothering to be my #1 job, my calling, my career...whatever you want to call it. It's what I do with most of my time. 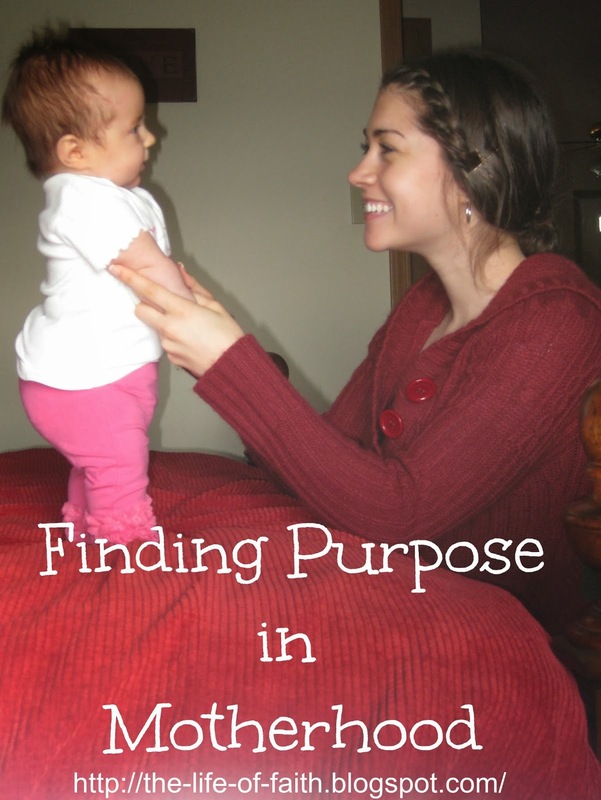 Honestly, one of the things I struggle with the most as a mother, is feeling purposeful. You know that feeling at the end of the day like you've accomplished something? It's a good feeling, but for me it often gets lost somewhere in the middle of the third poopy diaper of the day. I often find myself feeling like I need to do more with my life in order to really matter. Maybe you can relate! As humans, we crave significance. We want to be somebody, make a difference, and have a purpose. So where does that leave motherhood? I think our culture has subliminally (or maybe even blatantly) portrayed motherhood as an insignificant role in society. The idea of a mom just being a mom somehow blows people's minds these days. We are made to feel as if we have to do something else of importance along side our role as a mom. While, I understand the necessity of that in some situations, I think the mindset is horribly misguided. Mothers are vital to the shaping of the future. We have the largest impact on who our kids become, the values they learn, the manners they use, the attitudes they have, their perspectives on life, their beliefs about their purpose in this world. That's not insignificant. I would argue that the day to day shaping of a little life is a huge responsibility and quite possible one of the most important and influential jobs anyone can have. Being a mom does have many daily rewards as we get to experience the smiles, laughs, moments, milestones, and amazing love with our children. It's hard to see the big picture, however in those moments on your hands and knees cleaning spit up off the floor, wiping poop off your clothes, or cleaning off that nasty high chair tray for the 5th time that day. All those little things often seem so mundane, and meaningless. And at the end of the day, there is no recognition received for them. I think the reason our society does not value mothers is because we don't understand what it means to be a servant. We value being the "top guy", the "boss", the one giving the orders. The American dream is all about doing what's best for yourself, but we are so misguided to think that this life is all about us and our success. If that were the case, then yes, days of rocking crying babies, changing diapers, and cleaning high chair trays would often be meaningless. But what if I told you that being a mom has such value and purpose, not just in this life but the next. Read the following verse and take it to heart. Philippians 2:5-7 Have this mind among yourselves, which is yours in Christ Jesus who, though he was in the form of God, did not count equality with God a thing to be grasped, but emptied himself, by taking the form of a servant, being born in the likeness of men. Being a mom provides endless opportunities to be a servant. And I mean endless! And would you not say that some days emptying yourself is what you feel like you've done after all the cleaning of messes, answering cries, changing of diapers, dishes, etc? How amazing to realize that by being servants to our kids and husbands, we are following in the example of Christ! Yes, you mom are called to be an example of Christ to the little people all around you, to be a servant to your family, just as Christ became a servant in this world. It's a big deal! You are not insignificant when you are fulfilling the purpose God has for you. It's hard to be a servant in a culture where the attitude is all about self because to be a good mom, you have to sacrifice your self for the good of your children. But isn't that what the Bible says after all? John 15: 13 Greater love has no one than this: to lay down one's life for one's friends. Mamas, don't buy in to what the world tells you about your significance as a mom. You are not just a mom. You are not here to please the world, or prove to anyone that you are significant. You may not be successful in the world's eyes, but that is of no importance. You are a servant of Christ, and if you are serving your family with a heart of Christ than you are pleasing God and bringing Him glory. There is no greater purpose than that! So I want to encourage you, and challenge you to live each day with purpose because what you do matters! Aw I loved this. Thanks for the reminder! i can't wait to one day be a mom. 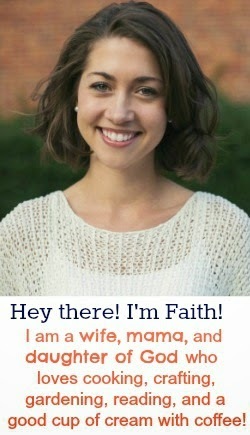 I love this post, Faith. It is so encouraging and really well-written. Thank you for the reminder that what we do is so vitally important and that God thinks it's great because we serve. It's a good reminder too as to why you feel so insignificant too. Very encouraging words! We are all called to be servants no matter what our position is. I've reflected on these same feelings. And that's what can be hard~getting caught up in our feelings and emotions. And they are real and are part of us, but we have to stay plugged into God, so Satan doesn't use our feelings against us. Blessings to you! What powerful and awesome reminders! And I agree that whether you are a full tome SAHM, work part or full time...motherhood is ALWAYS the #1 job! Great post. Our society really does undervalue the role of mother. I hate how the role of "just" a mom is portrayed in today's world. Found you through the Wed blog hop. Following with GFC. Beautifully written! Such a great post! Beautiful reminder of why I chose to be a stay-at-home mom! Thank you for sharing at Inspire Us Thursday on Organized 31.